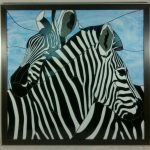 John Michael created a lovely detailed Zebra mosaic from our “Into Africa” Pattern CD, from Glass by Appointment Studio. Stunning! For all you glass mosaic fans, enjoy! Special thanks to John Michael as we so appreciate your sharing with all of us, and somehow missed the original email.